Here's Rusty Ole Robot Bob! YEP! 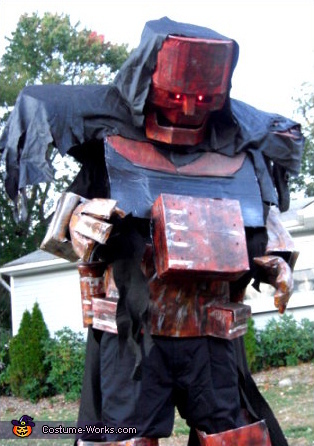 The wearer/creator of THIS Costume also has a few other family members in our 2008 Homemade Costume Contest. Bob is getting to be (or maybe always HAS been!?) a real Costume Creating Pro! This poor ole Rusty Hunk has sure seen better days.. HOWEVER! I am told that he has functional lights front and rear... AND for the sake of convenience 2 drinking cups with tubes running to mouth JUST IN CASE ole Rusty has a sudden thirst to quench Ü.